Wilderside Ltd presents its second eBook, Occupy Wall Street: What Just Happened? (only 99¢). In the eBook, the Occupy movement is explored through original reporting, photographs, cartoons, poetry, essays, and reviews. OWS:WJH? includes an essay analyzing the “One Demand” concept. The collection of essays and blog posts records the unfolding of Occupy into the culture from September 2011 to the present. 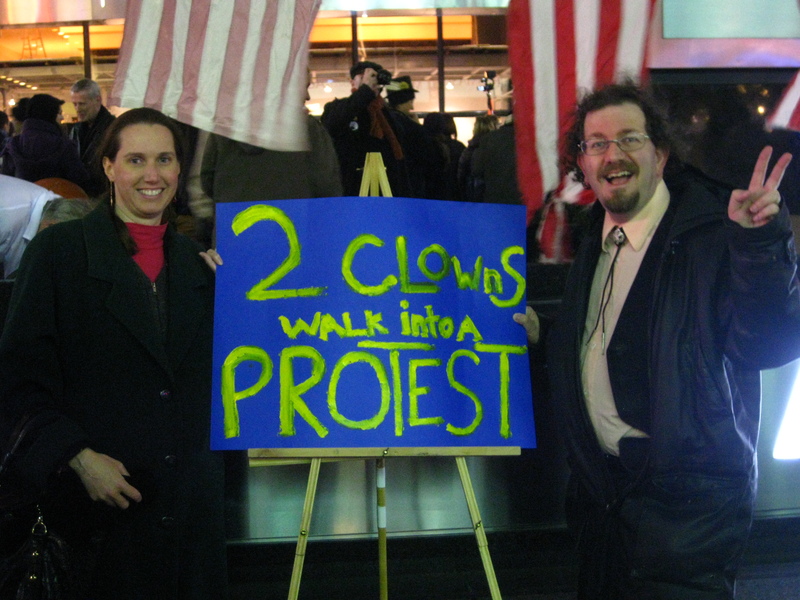 Authors Kimberly Wilder and Ian Wilder were early supporters of Occupy, using their internet platforms to communicate the changes being created by the American Autumn. The short answer is “No.” Occupy is very much alive. At least that is Ian’s short answer. Kimberly and I have recently been debating the meaning of Occupy, now that there is some distance from its inception. Kimberly became an early supporter of Occupy – using our website onthewilderside.com to herald its start as a true movement back to shared values. She quickly recognized the need to use our site to help counter the corporate spin. The first reason we know that Occupy lives on is that it has changed how people are talking about the world around us. Occupy Wall Street has permanently affected the vocabulary. The word “occupy”, and the phrases “1%” and “99%” now have universally understood meanings. Even more importantly, Occupy has carved out a space in the vocabulary of ideas where economic and political inequality can be discussed. For decades, the discussion of inequality had been forbidden from taking place in the public realm. To read the rest, buy the eBook for only $2.99. What’s in your Occupy Handbook? Another police killing: What if there were no police? Kimberly Wilder is a good poet, an adequate musician, and an excellent campfire singer (where it’s the enthusiasm that counts.) Kimberly has been ranting and advocating in letter format since she was a pre-teen. Later in life, poet Mark Rudman noted to her, “Distemper is your muse.” When she wants to be in a pleasant mood, Kimberly performs music for children or re-watches Charlotte Bronte and Jane Austen movies. Her first eBook is Georgiana, Duchess of Devonshire: The Ultimate Fan Guide. Occupy is her second eBook. Kimberly’s political outlook includes a commitment to nonviolence, and to the mantra, “First Do No Harm”. Ian Wilder is the son of Roosevelt Democrats. He learned from them that life is about voluntary service to other people; it is not about blind obedience to any organization. Ian took their lessons in leadership-by-service into the boards of a number of organizations: local chamber of commerce; two sustainability nonprofits; state Green Party; co-operative apartment complex; and – most recently – local library. He also charted his own path starting from where his parents had led him. One cannot serve others if he is doing violence to them. So, Ian has moved toward pacifism. Kimberly Wilder & Ian Wilder have had a marriage of art and activism for the past 14 years.